And how: The Blues Is Alive and Well‘s fifteen tracks feature pristine production without losing the signature lived-in grit that Guy’s been known for his entire career, from the low-slung riffage of “Bad Day” to the squealing solos of “Somebody Up There.” Guy sounds every bit as vital and youthful here as he did dating back to his early collaborations with the late Junior Wells, and it’s inspiring to hear a veteran artist laying down the blues with such gusto. And even as Guy pushes forward with his astounding career, he’s careful not to forget his late contemporaries who inspired him along the way. “I went to sleep yesterday and woke up and all the great blues players are no longer with us. Muddy, Wolf, B.B.—they’re all gone. Before they passed away, when they were in their prime, we used to have a drink and a laugh and talk about how when one of us is gone, the others have to keep it going. 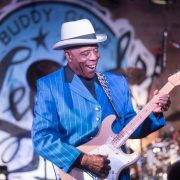 I’m trying to do something to keep this music that I love so well alive.” And with The Blues Is Alive and Well, it’s clear that the music—and Guy himself—ain’t going away anytime soon.